Le Thanh Duc joined the military in 1975. A few years later he was promoted and sent to the Hieng Community in Da Nang. He told me that when he arrived the forest had already been burned by what he later came to know as Agent Orange. He stayed in or near Da Nang for over four years. 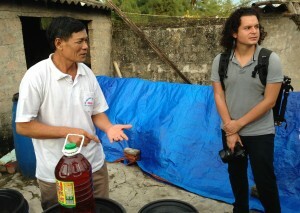 After patrolling near the Da Nang Airport, Mr. Duc and others were asked to remove a leaking canister from the grounds. He later realized that canister was Agent Orange that had been stored at the airport. In the days following he experienced a range of symptoms, including dizziness and headaches. The symptoms later faded. Mr. Duc continued to work at Da Nang Airport which was by now known to be an AO “hotspot,” for over a year. 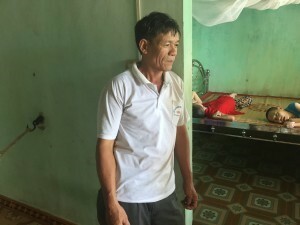 After he returned to his home in Bo Thach district, Mr. Duc suffered from intermittent fevers and ailments until he was formally diagnosed by a government doctor as “suffering from Agent Orange side effects.” There are no known disabilities resulting from birth defects in his family or the wife of his family. Nonetheless, their first three children were born with an unknown ailment. The last three were born healthy. 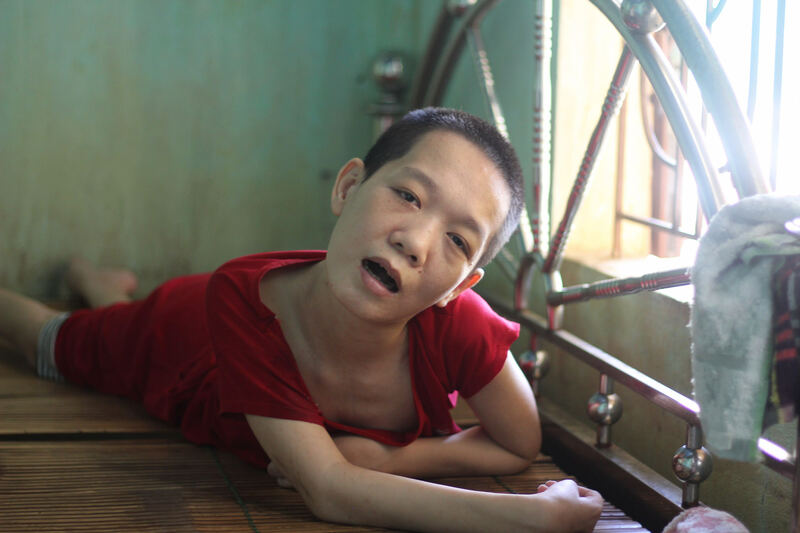 Le Thi Phoung’s health has continued to degenerate and the paralysis has progressed to the point where she cannot sit up or talk. She is always prostrate and depends on her parents to feed her and change her, as she has lost control of her bodily functions. Her muscles have degraded and she has very little muscle mass. Her back is sharply arched, something that has happened gradually, and her hands are bent. Her family does not know if her mind has been affected because she cannot speak or communicate other than with the occasional smile. Sometimes she cries out. When she does this, her parents move her to a new position, on her stomach or her side, which they say is what she wants. The next two children to be born, both daughters, Le Thi No (b. 1986) and Le Thi Lanh (b. 1988), have suffered like their older sister. They too were born without any apparent disorders, but as they grew, by age 10, the same strange symptoms appeared. Their parents say the disease only progresses, and there is no cure. The next three children to be born grew up without medical problems. The three affected children all respond to the sounds of their parents’ voices with smiles and sounds. According to Le Thanh Duc, his youngest daughter Le Thi Lanh can text very simple messages on a cell phone, even though she cannot speak. This may be evidence that the children still have some normal cognitive function that is masked by the paralysis. Le Thanh Duc is convinced that it was his exposure to AO in Da Nang that led to the family’s medical problems. However, he bears no ill will, preferring instead to leave the past alone and look forward to a better future that will allow him to better care for his family financially. He and his wife are totally preoccupied with caring for their sick children, although AEPD has been speaking with them about a micro-loan to produce a fish sauce. Such a business could be run from the home and allow the parents to continue to care for their children, while still earning some money to run the household. However, even this may not be enough. 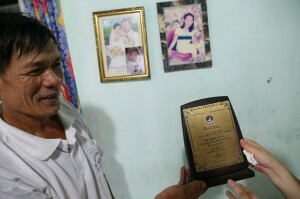 Le Thanh and his wife do not possess the medical skills to fully care for their children. The family lacks the transportation and funds to ensure that the children are seen regularly by a medical doctor or meet a medical emergency. The family needs expert advice, medical supplies, and medical care. Additionally, the Duc family does not mingle with the parents of other children in their community that also suffers. According to the AEPD outreach worker that accompanied me, there are many families with Agent Orange children – enough to start a community support group. The problem is the social stigma that comes from having a family member with disabilities. It especially problematic when it comes to disabilities that might appear – to the untrained eye – to be caused by a contagious illness. As a result, Duc fears that if neighbors and others in the community find out that his children are ill with this wasting disease they would stay away and keep Duc away from their homes. This sort of “polite ostracization” leads parents like Duc and Ho Thi Hong to keep the condition of their children as quiet as possible, adding to their sense of isolation. Le Thanh Duc meets with us in the same room where he met with Kelly Howell in 2013. His three daughters are lying on the same large bed that they lay on two years ago, and seem bathed in the same colors and afternoon light. They are now aged 30, 27 and 29. They interrupt our talk with short barks and moans. Mr. Duc and his wife Ho Thi Hong have suffered another tragedy since they met with Kelly. Their youngest son died in 2014 at the age of 18 in a car accident. He had been spared Agent Orange and the irony was striking. Everyone was so nervous when Mr. Duc’s oldest son joined the army that AEPD even asked the authorities to keep an eye out for him. The loss of her son has further unnerved Mr. Duc’s wife, who has never come to terms with the illness of their three daughters. Linh, our translator, says she is “shocked, depressed and sad – not at all normal.” Mrs. Hong appears midway through our discussion and bursts into tears when we produce a print-out from the AP website which carries a photo of her daughters. The problem is that she is also a primary caregiver in this damaged family. Unlike other families, where the mother is strong, Mrs. Hong clearly needs care herself. Le Thanh Duc shows 2015 Peace Fellow Armando Gallardo around his fish business, which later closed down after pollution killed off fish in the area. Luckily, it is not all bad. In a reversal of roles, her husband is upbeat and optimistic. Since he met with Kelly in 2013, Mr. Duc has used a loan from AEPD to launch a new business to make fish sauce. He also appeared on television on December 3, 2014, to celebrate International Disability Day. This turned him into a celebrity and he tells us with pride that a company in Hanoi donated 100 million Dong to disability causes after seeing him on television. “I like to raise awareness!” he says through Linh. Mr. Duc is bursting to give us a tour of his business, which he runs with his sister, and he takes us down the path to a shed where it all happens. Oblivious to the smell, he tells us that AEPD loaned him 17 million Dong (through Irish Aid) in 2013, which he used to buy ten large pots and other equipment. Each year he borrows 10 million Dong to buy anchovies, which he stores in the pots for several months. It normally costs about 12 million Dong to fill the pots, but it cost almost double in 2014 because of the storms, which the Vietnamese put down to climate change. After a year of stewing, the fish sauce is ripe, ready and very strong. It is also very popular in restaurants. Mr. Duc earns 3.4 million Dong from selling fish. In addition, he receives 9 million Dong a month from the government for the Agent Orange sickness suffered by his daughters, himself and his wife. This may seem like a lot, but his expenses are considerable: 1 million Dong to pay for home care and several million Dong a month to pay for electricity and the repayment on his bank loan. It does not leave much. And as Armando points out, his fish business depends on the whims of Mother Nature. Mr. Duc is undaunted. He wants to buy more pots and open a store. He also wants to put photos on the walls of his house, which are bare. His enthusiasm is infectious – and unexpected. The village where Le Thanh Duc’s family lives is around 15 miles north of Dong Hoi, nestled among sand dunes near the Pacific coast. In the wake of our harrowing visit to Pham Thi Do, Mr. Duc’s warm, cheerful greeting as we arrive feels a bit jarring. That feeling only increases when we see what awaits us inside the house. Mr. Duc’s house is fairly large, and we once again sit at a table in the foyer. As soon as we enter, I see two girls sprawled on a bed in a room to my right—these are Mr. Duc’s children, Phuong and No. Both are paralyzed and unable to speak or move; they make groaning sounds throughout our visit, which their parents can apparently understand. Another paralyzed girl, Lanh, lies on a bed in her own room to my left. Phuong and No, in particular, don’t look comfortable—their gasps put me in mind of fish out of the water. In addition to Mr. Duc, we’re joined by his wife, Ho Thi Hong (who looks frail and says little) and the president of the local branch of the Vietnam Association of Victims of Agent Orange/Dioxin (VAVA). Mr. Duc (as described here) was contaminated while serving in the military after the American War, during a cleanup operation at Da Nang Airport; he would later suffer from fevers and other ailments linked to Agent Orange, and the first three of his six children were born with disabilities, as we can see. I’m startled to realize at this point that the three daughters, who I would have assumed to be in their teens, are all well into adulthood—Phuong is 34, No is 31 and Lanh is 25. Whatever ailment has caused their paralysis has also kept them from growing into adults. Mr. Duc had previously gotten a loan from AEPD to start a fish sauce business, but that business collapsed last year after a mass die-off of fish in nearby waters, believed to be the result of contamination from a steel plant. Undaunted, Mr. Duc, with the support of AP donors, bought three pigs and 80 chickens to raise in an enclosure behind his house. Mr. Duc tells us that a decline in the pork market forced him to sell his pigs, but that he still made a profit of 4 million Vietnamese dong (around $175), which Ngoc tells me is a respectable amount. He’s still raising his chickens, and has made another 4 million dong in net profit from them in the past few months; if the pork market improves, Mr. Duc says, he may buy more pigs to raise. Having a variety of animals is “very useful” for making money, he says. Mr. Duc seems optimistic about his business, but the tone of our conversation shifts as the subject turns to his children. 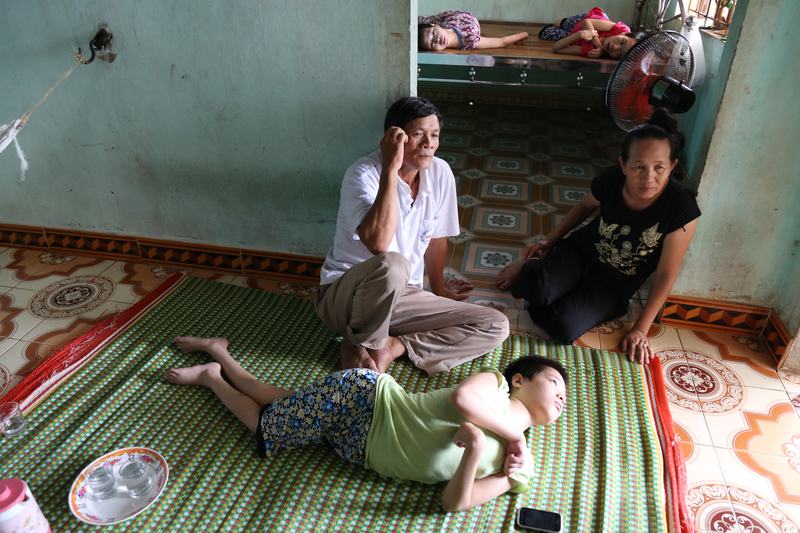 Phuong, No, and Lanh are getting “worse and worse,” Mr. Duc says, and due to his wife’s weakness he’s the only one who can properly care for them and “release their pain.” The children are now unable to leave their beds. In the past he’s taken them to doctors, Mr. Duc says, but “no one can help them.” Lanh, I learn, can actually use a smartphone to send basic text messages to make her needs known, and can use it to browse social media, watch movies, and otherwise keep herself occupied. Unlike her sisters, Lanh was able to go to school until she was 9 and is thus able to read and write. Phuong and No can understand speech to some extent, but cannot communicate outside of the groans we hear. At this point, I ask about the health of Mr. Duc and Mrs. Hong, and Mr. Duc tells me that they’ve had “many difficulties.” It’s getting harder and harder to care for his daughters as he ages, he says, and he fears what will happen when he’s no longer able to keep up with them. Mr. Duc has three healthy children, and he’s hoping they can care for their sisters after he dies, but that’s only a hope—they have their own families to care for as well. “He’s very sad when he thinks about the future,” Dat tells me. Throughout our conversation a few children, presumably healthy grandchildren of Mr. Duc and Mrs. Hong, run around the house, their hyperactive energy contrasting with the mood of the visit. I see one of them jump on the bed where Phuong and No, his paralyzed aunts, lie, before getting bored and heading off somewhere else. Despite his anxiety about the future, Mr. Duc says he’s hopeful about expanding his business; he’d like support in opening a grocery store to bring in more income, leading to more savings. He had wanted to open a grocery store before instead of raising animals, he says, but even with AEPD support the amount of capital needed was too great. In the meantime, he’s doing well at raising chickens, and gets support from AEPD, VAVA and other organizations; he is active in one of AEPD’s local self-help groups for disabled people. The government has helped some, he says, but government support can only go so far—there are many Agent Orange aid recipients in this region, and a limited amount of aid to give them. His “last wish,” Mr. Duc says, is to start a savings account, possibly with outside help, and raise money to ensure that his children are cared for after he dies or becomes too frail to carry on. With enough money, Mr. Duc could either hire a caretaker to look after his daughters or send them to the mental hospital currently under construction in Dong Hoi, where they could be treated by professionals. But he would still have to pay for their upkeep in the hospital, so it’s uncertain how realistic that option is. In the meantime, I tell Mr. Duc that we’ll do what we can to support his family and his new livelihood. Phuong is the first person to see us as we park the car in front of their home. Mr. Duc welcomes us inside and we sit on a mat in their common space. Phuong and No’s and Lanh’s rooms open toward the common space. Mr. Le Thanh Duc sits with his daughter, Le Thi No (32 years old). No shares this bed with her sister, Le Thi Phuong (35 years old, not pictured). While she Ms. Hong is away Mr. Duc is responsible for everything and seems to have a very small (if nonexistent) support system–he seems to prefer it this way. He is proud to tell me that his youngest daughter has gotten married and is now a teacher on Phu Quoc Island and his only surviving son has become a policeman in the commune. Phuong, No, and Lanh are doing well. While chuckling and looking over at Lanh (who had been engaged in the conversation), Mr. Duc remarks that she is able to use the smartphone and look up videos she is interested in watching. Lanh flashes a sheepish smile and puts her head down. 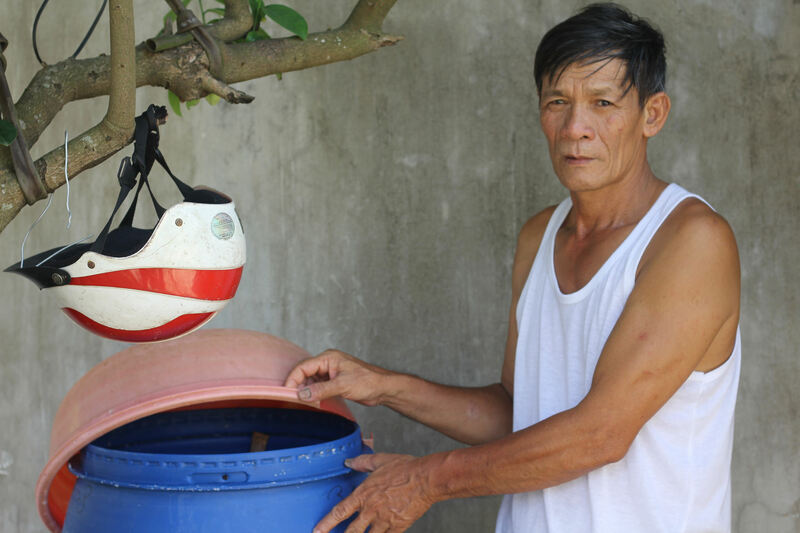 Since the Formosa environmental disaster in 2016, Mr. Duc has been raising chickens and pigs to supplement his income. He sold all of the pigs in 2017 for 15M VND (~$650 USD). There was a rampant pig disease at the time and he wanted to get out ahead of it. Mr. Duc used the profit to invest in his chicken-raising business model and relaunch his fish sauce business in early 2018. The government facilitated an environmental clean-up and has since declared the water in Quang Binh clean and clear of pollutants. Interestingly enough, Mr. Duc had started to plan to open a grocery store but did not have enough capital to get the business off the ground. Once he learned the ocean was clean again, he leveraged the capital from the pig sales and existing knowledge to pick up where he left his fish sauce business in 2016. The blue barrel is where Mr. Duc makes his fish sauce. The barrel is full of fish sauce and he hopes to sell it this fall. He would like to expand this business and hopes to qualify for a loan from the AEPD-Zebunet micro-credit program to do so. Mr. Duc explains that it takes nine months to make fish sauce and he anticipates being able to generate 5-6M VND per year from it. If he were able to produce more sauce, he would be able to generate a greater profit. Unfortunately, however, he does not have any additional capital to invest at this moment. As Mr. Duc was recounting and sharing his experiences, Mr. Thuan (Outreach Worker) mentioned the credit program AEPD currently implements with the support of Zebunet, a French nonprofit organization. Mr. Thuan believes Mr. Duc could qualify for a 10M VND loan and offered to connect him to the program and/or Zebunet to scale the business and thus, improve his annual income. Currently, the family makes 15M VND per year (which includes the 500,000 VND per month generated by chicken sales) and it is just enough for food and their expenses. But a bigger question and worry remains for Mr. Duc: “What will happen to my children in the event of my passing?” Like other Campaign beneficiaries, Mr. Duc is thinking toward the future and wondering how best to set up a contingency plan in case of an emergency. And that is truly the big and very real question that haunts these caregivers. 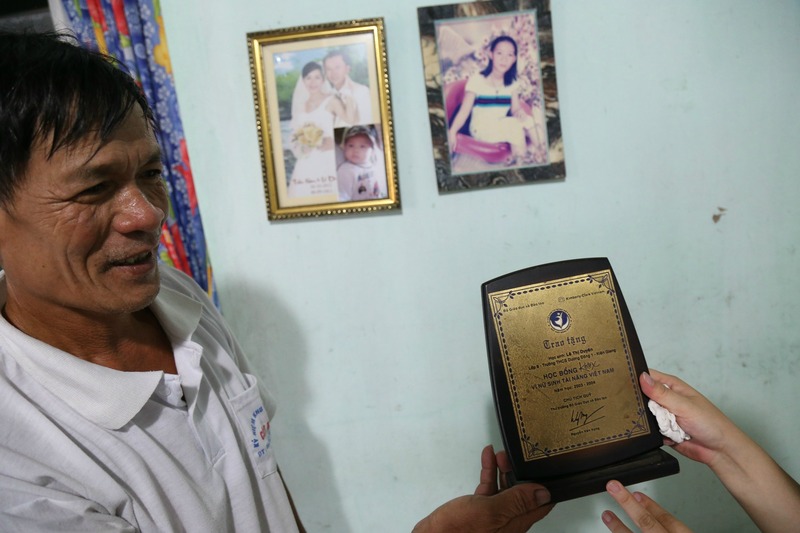 The best he can do is save enough money such that his daughters can live at the only home for persons with disabilities in Quang Binh after his passing. In the meantime, though, the best we can do for/with them is to support his sustainable endeavors, provide guidance, and advocate for “contingency plans” and holistic institutional support. Mr. Duc is prepared to do it and we are confident in and inspired by his abilities. It is a true pleasure to work with Mr. Duc’s family. Le Thi Phuong (35 years old) is Mr. Duc’s oldest daughter. She shares a bed with No and is constantly peeking out of the window. She was the first to greet us when we arrived at Mr. Duc’s home.